""Hel" is a beautiful folk history in the Nordic land and a perfect tribute to an ancestral culture." The Faroese of Tyre plays a heavy Viking folk with a certain talent for epic melodies for twenty years. It has been more than five years since the band gave any news and this seventh album, called "Hel", was expected. Attila Vörös and Tadeusz Rieckmann joined the group on guitar and drums. Tyr likes to please with well-filled records and there he surpasses himself with more than an hour of music, but if generosity is good, we can sometimes fear some overflowing and weariness. Fortunately, "Hel" is well built and avoids this pitfall. Admittedly, it requires an effort of concentration and listening to understand it, but this is worth it. 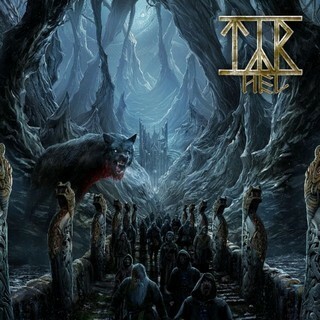 Tyr is also not making it easy by starting his record with 'Gates Of Hell'. A long track with drawers, it offers an introduction to the piano, an alternation between power and melody with raspy and clear vocals and heavy solos. It is like an enthronement test in this northern universe. Then Tyr alternates the moods between the tracks and shows his ability to vary the pleasures. This big hour of music is playing perfectly. When it comes to epic heavy that takes you far into Viking lands, Tyr is an expert. There is a breath, a sense of adventure and the feeling of diving into the heart of the battle. 'All Heroes Fall' , 'Downhill Drunk' , 'Empire Of The North' or 'Fire And Flame' make you want to raise your fist furiously with a little epic side close to Iron Maiden. The sometimes raspy and sometimes clear song of charismatic Heri Joensen is a formidable tool for rallying to the band's cause. Besides the adventure there is also a dive into the Nordic roots. First there are 'Ragnars Kvæði' and 'Alvur Kongur'. Sung in their native language, they allow musicians to tell us beautiful stories with a rare epic strength and a flamboyant Viking side. In English, 'Sunset Shore' and 'King Of Time' are equally strong. The first one carried by a very pure song is a catchy and aerial power ballad. The second one takes you far north in the style of an adventure novel. With "Hel", Tyr signs a compelling work. A beautiful history in the Nordic land, it is a perfect tribute to an ancestral culture. The band continues its journey in a great way and asserts itself even more as one of the leaders of the genre. "Hel" is a beautiful folk history in the Nordic land and a perfect tribute to an ancestral culture.